This seems like an easy choice to feature for something beautiful IN Montréal to get you outdoors – it is, after all, Montréal’s largest park. However, sometimes you can’t see the forest for the trees and it’s worth re-visiting this wonderful park this weekend if you haven’t done so in a while. I think that with the amount of activities this park has to offer, I could feature it weekly. However, for this particular Issue, I wanted to get a jump on the “endless” summer weekends approaching and remind you all to think of the Cap when planning your weekend excursions. 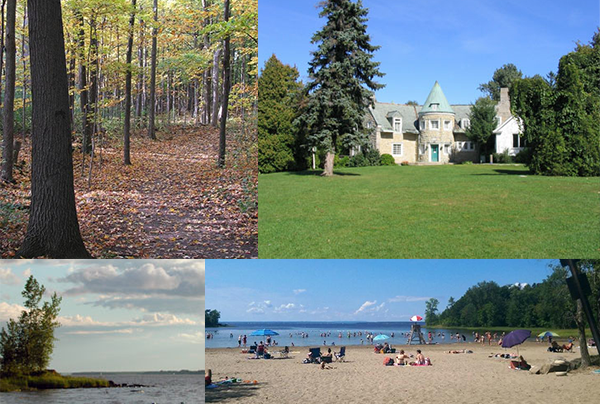 Here you can laze away on the beach, swim in Lac des Deux Montagnes, visit an organic farm (they offers tours, a sugar shack, & at harvest time, sell produce from the farm in an old-fashioned general store), catch a fish or two, picnic til you can’t picnic no more, cycle on the nice flat trails, or just stroll… like seriously stroll amongst some wonderful beauty. Depending on your family makeup, and equipment setup (i.e. have bike & bike rack? ), my “see-it-all” recommendation would be to park at the Chalet d’accueil, jump on your bike, head north on the bike path, make a stop at the farm, then continue on your way west(ish) to see the Maison Brunet (it’s currently being restored, but it’s still quite glorious to see), and finally head on down to the beach and splash it up, splashy pants! Once you’re done, it’s a leisurely ride pass the sugar shack back to your car. A great beach & swim system for the hot hot Montréal summer heat. Provides a great opportunity to see a different side of the island. A pain in the whatnots to get to if you are un-automobiled. You can get there by public transportation but you should leave now if you want to hit it up this weekend. Some people can’t handle the lake bottom at the swimming area. I don’t mind it at all but it’s kind of squishy in between the toes. Mosquitoes. Clearly, you should be prepared. Hit up Walmart or someplace similar and buy some water shoes. They’re inexpensive and glorious for gross lake bottoms, hard rocked beaches and mud. 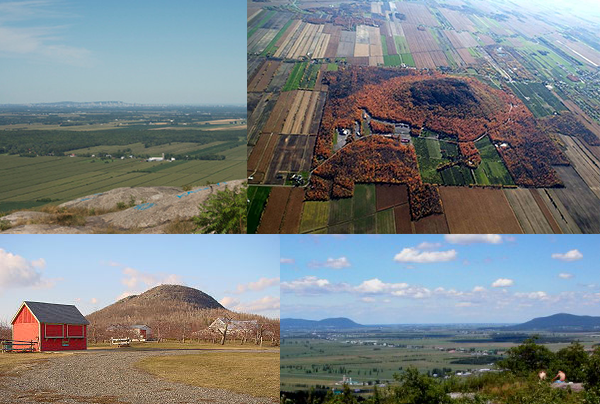 An oft-overlooked, or forgotten, mountain in the area known as Montérégie, this is one of my secret favourites. I suppose it lacks the size, lore and lustre of others (Mont-Saint-Bruno, Mont Saint-Hilaire to name a couple), but it’s so accessible, void of crowds, and challenging, in its own way. While you will definitely find longer and more arduous hikes in the area, Mont Saint-Grégoire provides a great opportunity to hike forest floor, man-made steps, lookout platforms and even a little scrambling as you approach the summit. To have all of that in a ~3km hike, well, that’s pretty impressive. On a clear day, when reaching the summit, you are rewarded with an outstanding view in all directions. You can see surrounding mountains including the ones mentioned above, as well as Rougemont, Mont Brome (Bromont), Mont Royal, Montréal’s city skyline, the Adirondacks and a ton of flat farmland (that is somehow quite beautiful). It’s not necessarily one for the very wee ones out there (I’d say 6yrs old+ is a safe bet), but it’s very accessible for just about anyone yearning for some outdoors. It’s close. Like real close. Like you can probably see your house from the summit close. Diversity of terrain in a very short distance makes for some serious low-key fun. Speaking of diversity, Arbraska has also set up shop here… if yer into that. You’ll discover a wee little mountain that not many people visit – means some potential peace & quiet and some serious deep-breathing opportunities. It’s not big. If you’re up for a big ol’ burnin hike, there are not too many options here, no matter how you slice ’em. There’s no immediate surrounding town to peruse before or after your hike. aka the Municipalité de Mont-Saint-Grégoire more or less begins and ends with this little gem of a mountain. There was once a serious piece of history located on the slopes of the mountain that was ploughed over during landscaping in the 1950’s. One of our unofficial founding fathers, and adamant supporter of aboriginal rights, Sir John Johnson’s family burial vault was unceremoniously buried in rubble. A negative bit of history for this mountain (albeit with a potentially positive outcome). After your hike, since you’re so close, why not drive down the road to Farnham, visit Farnham Ale & Lager and treat yourself to a wonderful freshly brewed Summer Pale Ale 42 from this fine brewery? Go on, you deserve it. I also suggest checking out Fromagerie des Cantons across the street – outstanding cheeses.